The chicas are happy. When the chicas are happy, I am happy. I wonder if I can have too many pictures of my happy chicas? Just kidding. I don't wonder. I know that I cannot have too many pictures of my happy hens. I waited a very long time to have hens, and now they are here... well, I simply do not tire of their pretty faces, their dust bath contortions, their chattering and clucking, their warm eggs, their absurd antics and mischief. And if they are willing to pose for me, well, how can I resist taking more pictures of my dear chicas? Betty. Lady Betty Oprington, the dowager empress of our little farm by the sea. She hasn't laid an egg in months. Those days may be in the past, but she is my old dear, and I am content to watch her run across the lawn, and move through the yellow flowered sour grass. Kamen... in honor of Dean Kamen, because she hatched during the FIRST Robotics Competition in San Diego, and she bears an uncanny resemblance to the man who wants us to put science and technology FIRST! The fact that she survived a nearly fatal bobcat attack, with the healing powers of science and love, gives her an even greater aura of celebrity. And here is Puff. Dear Puff. She is Kamen's mother. She is small, and fluffy and round. She is a Puff. Maria named her. The chicas must have agreed it was time to get new photos taken of themselves, because they all were so cooperative. This is one of very few good pictures I have of Puff, who usually appears as a little-black-puff of a rain cloud, on the move, and dusty. Shebot-the Mini-Bot is another who is not easy to photograph. She moves, all the time, and her eyes are completely lost beneath her Polish pompadour. She is an FRC day sister, like Kamen, named for the fast moving Mini-Bots of LOGO Motion. With a Polish rooster for a papa, and a Silky mama, Shebot is pretty, silky, and soft. She has that dark Silky skin... blue and purple, and her feathers feel nearly downy, though they are smoother than her fluff-puff mama's. This is Penny. She is the daughter of Zoltar, the great, late rooster. Her mother is... well... either Zelda, Puff, or possibly Shebot. She has a lot of gray in her tail end. She is a bitty thing... even smaller than the Silkies. The eggs she and the Little Debbies lay are adorable. This is one of the hens we are calling Little Debbie. I cannot tell them apart. They are both petite and handsome... winsome? They are petite and winsome hens. Other Little Debbie. I cannot tell them apart. Hello, you winsome lady bird. Well. I guess that's everyone. Oh. No. Wait. Where is Zelda, our downy white puff of a lady bird? Zelda is a mama. She loves her nest, and her clutch of eggs. She loves her chicks. And she has been broody, all week. We take the eggs, but she sits. We pick her up and hug her and cluck to her, but she sits. Poor dear. She doesn't realize that without a male suitor, her efforts are in vain. I know she will come around, eventually. Zelda, Silky Princess. We love you. It seems that I was occupied with other things, and have not been to see you for some time. I love the chickens, they do look pretty. Looking at them calms me way down. I'm glad you could stop by. When I need some calming, or amusement, you can find me with the chickens... it works wonders! Playing catch-up… a long over due visit! Love reading what's going on in your beautiful family's life, always! Love the farming, choco-faces and all the creatures great and small. And I'm cracking up that you have two chickens with the same name, but one is "Other". BTW, I think Other Little Debbie has more lipstick on. 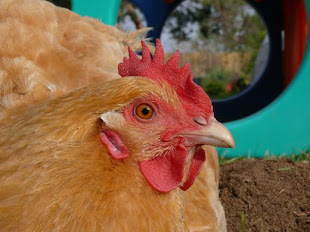 Of course you cannot have too many chica pictures...this is Chickenblog, after all!